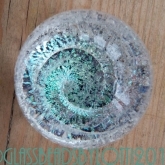 This is my page with information about the memorial glass pieces I make. The death of a loved one or beloved pet is devastating to us all and we yearn for something to remember them by. I find that standing by a grave side, no matter how beautiful the location, isn’t enough and personal belongings can bring some comfort but this can fade in time. 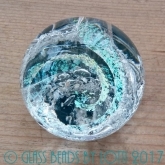 Some years ago I was asked to make something for a friend whose Grandmother had passed away, and after some thought and discussion we decided that a memorial glass mini paperweight with ashes in would be something the friend would treasure; it is a comforting shape and the glass takes on the warmth of your hand when you hold it. One customer told me ‘Now I can hold her in my hand as well as my heart’. These words touched me deeply knowing that I had bought this person some comfort. Since that time I have been asked to make several more pieces for friends and through word of mouth and have received such lovely feedback. I feel honoured to be able to provide some comfort at such a sad time. 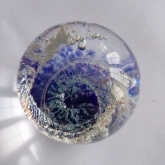 The pieces I have made have been for both people and pets and include the mini glass memorial paperweights (or marbles) of around 4cm in diameter in a ‘galaxy style’ as shown below; marble pendants; and cufflinks as shown in the photos below. 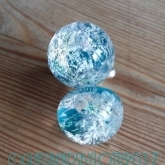 I can produce these in a variety of colours and will include some sparkle in it from some special glass I have to enhance the ‘galaxy effect’. 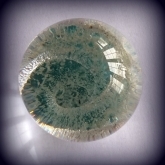 The sparkle can be in the same colour as the piece or a different colour. 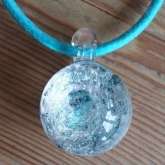 The pendants can come with different colour leather cord with sterling silver ends and clasps in any length you like, I can also make these necklaces in waxed cotton cord, or I can provide sterling silver chains. 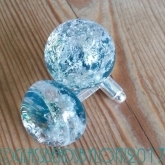 The cufflinks can have sterling or silver plated bases (sterling is a higher cost of course). I fully appreciate the sensitivity of the time in your life when you might be thinking of glass memorials with ashes in and promise to treat the cremains with all respect as if they belonged to a member of my own family or my beloved pet. I generally would need a couple of teaspoons of the cremains and any that I don’t use will be returned to you with your item. In terms of timelines I at my busiest between Easter and the end of September and I like to be calm and focused when I make these pieces, so generally would be looking at a 2 month timeline to create a piece (although of course this timeline can be discussed). Between October and Easter I should be able to complete a piece in around 4 weeks. I can’t at the moment provide an engraving service but am looking into a local engravers in case anyone wanted this. If you would like more information or to discuss your requirements please contact me or email me and I will be more than happy to help. 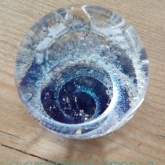 If you are interested in a fused glass piece, for example a picture or free-standing piece, I often work with a talented fused glass artist who can make these pieces for you, for more information on the fused glass work please contact me for more info. For my price list please have a look at my price list page. I hope I can provide you with something to treasure, to keep a loved one close and provide a little comfort.